Pablo walked down the main street. He stuck his head in the buildings. “Where is everyone? Is there a grand party in the town square?” Listening carefully, Pablo still couldn't hear any noises. The main street was deserted. “Oh my. I'm all alone in the town.” He hung his head down and wandered from door to door. “Today is my birthday. I was hoping there was going to be a grand party, a birthday party for me. Nobody remembered. Nobody cares about donkeys. Pablo came to the steps that led down to the town square. “I shall go to the fountain and wait. 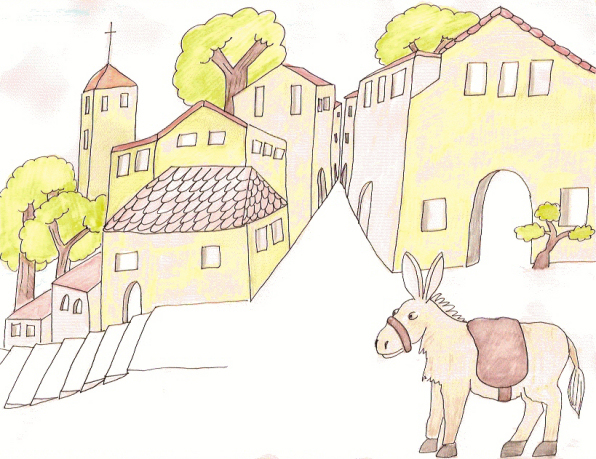 Maybe the townspeople are all taking long siestas today.” Down he went, one step at a time. He sauntered to the fountain and looked at his reflection in the water. Pablo's long ears stuck up in the air. “What was that?” He turned around. All the townspeople stood beside him. “Happy birthday, Pablo.” Shouts rang out, filling the air with cheers and oles. They feasted on cake and caramel flan and custards and Pablo got to eat all the tortillas he wanted. “This is the best birthday I've ever had,” Pablo said and then he ate another tortilla.